Millions of phony accounts. Fake bank card PIN numbers. Fictitious email accounts. Wells Fargo admitted to firing 5,300 employees for engaging in these shocking tactics. The bank earlier this month paid $185 million in penalties and has since apologized. Now CNNMoney is hearing from former Wells Fargo (WFC) workers around the country who tried to put a stop to these illegal tactics. Almost half a dozen workers who spoke with us say they paid dearly for trying to do the right thing: they were fired. 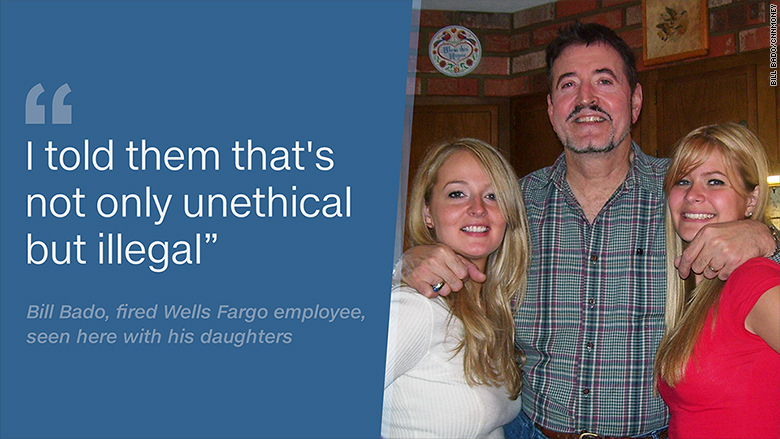 "They ruined my life," Bill Bado, a former Wells Fargo banker in Pennsylvania, told CNNMoney. Bado not only refused orders to open phony bank and credit accounts. The New Jersey man called an ethics hotline and sent an email to human resources in September 2013, flagging unethical sales activities he was being instructed to do. Eight days after that email, a copy of which CNNMoney obtained, Bado was terminated. The stated reason? Tardiness. Retaliating against whistleblowers is a major breach of trust. Ethics hotlines are exactly the kind of safeguards put in place to prevent illegal activity from taking place and provide refuge to employees from dangerous work environments. Wells Fargo CEO John Stumpf made precisely that point on Tuesday when he testified before angry Senators. "Each team member, no matter where you are in the organization, is encouraged to raise their hands," Stumpf told lawmakers. He mentioned the anonymous ethics line, adding, "We want to hear from them." But that's not the experience of some former Wells Fargo workers. One former Wells Fargo human resources official even said the bank had a method in place to retaliate against tipsters. He said that Wells Fargo would find ways to fire employees "in retaliation for shining light" on sales issues. It could be as simple as monitoring the employee to find a fault, like showing up a few minutes late on several occasions. "If this person was supposed to be at the branch at 8:30 a.m. and they showed up at 8:32 a.m, they would fire them," the former human resources official told CNNMoney, on the condition he remain anonymous out of fear for his career. CNNMoney spoke to a total of four ex-Wells Fargo workers, including Bado, who believe they were fired because they tipped off the bank about unethical sales practices. Another six former Wells Fargo employees told CNNMoney they witnessed similar behavior at Wells Fargo -- even though the company has a policy in place that is supposed to prevent retaliation against whistleblowers. CNNMoney has taken steps to confirm that the workers who spoke anonymously did work at Wells Fargo and in some cases interviewed colleagues who corroborated their reports. It's possible Wells Fargo could face legal consequences for any retaliation that occurred against employees who called the ethics line. "It is clearly against the law for any company (or executives of such companies) to try to suppress whistleblowing," Harvey Pitt, former chairman of the SEC, told CNNMoney in an email. A number of statutes -- including Sarbanes-Oxley and Dodd-Frank -- "make this unambiguously clear," Pitt said. "I endured harsh bullying ... defamation of character, and eventually being pinned for something I didn't do," said Heather Brock, who was fired earlier this month as a senior business banker at a Wells Fargo branch in Round Rock, Texas. One such former employee was fired after flagging issues directly to Stumpf, according to Senator Bob Menendez. At the Senate hearing, Menendez read the New Jersey woman's 2011 email to Stumpf, where she described improper sales tactics she felt were "wrong." "Did you read that email?" Menendez asked Stumpf. "I don't remember that one," Stumpf replied. "Okay, well she was fired. ... So much for the safe haven," Menendez said. Several senators spoke about the plight of the mostly 5,300, low-level employees who were fired related to the scandal. The firing certainly took a huge toll on Bado's life. It put a permanent stain on his securities license, scaring off other prospective bank employers. Today, the New Jersey man's house is on the verge of being foreclosed on and he's working part-time, at Shop-Rite. "You wonder where the justice is," Bado said. Ken Springer, a former FBI agent who runs a firm that offers a whistleblower hotline service, was alarmed by the allegations made by former Wells Fargo employees. "That's retaliation. It's a big problem -- and a perfect example of what shouldn't happen," Springer said. 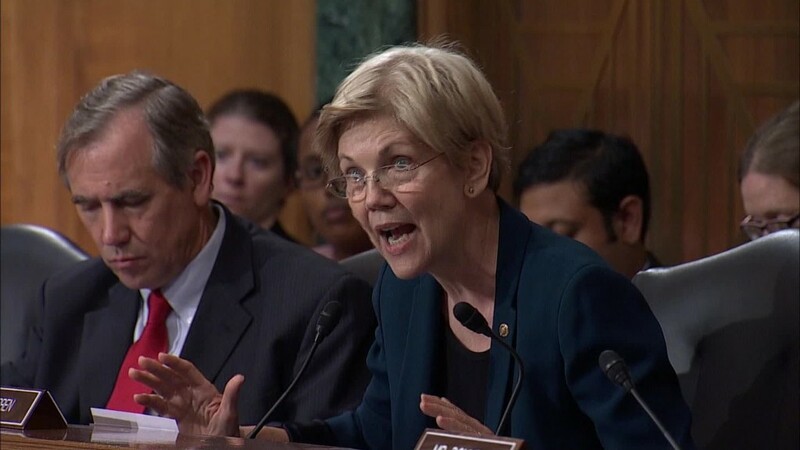 "It looks like there's been a terrible breakdown of checks and balances at Wells Fargo." In response to CNNMoney's report, a Wells Fargo spokeswoman said: "We do not tolerate retaliation against team members who report their concerns in good faith." She emphasized that employees are encouraged to immediately report unethical behavior to their manager, HR representative or 24-hour ethics line. Wells Fargo confirmed to CNNMoney that Bado had worked there. However, the bank declined to comment on why Bado left and and on the ethics complaint with corresponding report number he cited in emails. "Everything submitted to the EthicsLine is investigated," a Wells Fargo spokeswoman said. While ethics complaints are supposed to be confidential, documents show that Bado did speak out before he was fired. On September 19, 2013, Bado wrote an email to a Wells Fargo HR rep and copied his regional manager, where he detailed improper sales tactics. Documents show Bado was fired -- for "excessive tardiness" -- just eight days later. "I have been asked on several occasions to do things that I know are not ethical and would be grounds for discharge," Bado said in the email to HR. He said a branch manager on "many occasions" asked him to send out a debit card, "pin it," and enroll customers in online banking -- "all without the customers (sic) request or knowledge." Those are precisely the same practices that regulators fined Wells Fargo for three years later and that senators grilled the bank over this week. 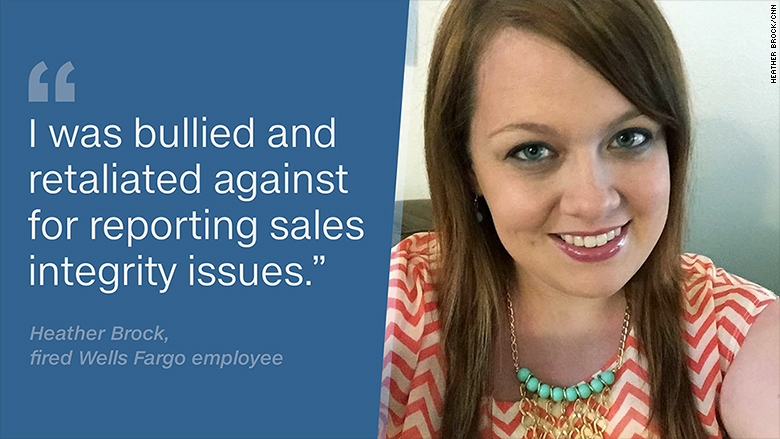 Brock, the business banker from Texas, told CNNMoney she experienced a similar situation. The 26-year-old single parent of two young boys was fired soon after she contacted the company's ethics line about illegal sales practices she witnessed. Wells Fargo also confirmed Brock used to work at the company but declined to comment further. Brock was fired earlier this month, with Wells Fargo accusing her of falsifying documents -- a charge Brock emphatically denies. Brock said the company bullied her into admitting she did something wrong. A current Wells Fargo employee who works in Brock's branch vouched for her version of events. "That's really scary when you're with a big corporation like this and HR doesn't have your back," said the current employee, who wished to remain anonymous so as not to get fired as well. Brock is hoping her story forces meaningful change at Wells Fargo. "You lose if you do complain and you lose if you don't. What does a powerless employee do?" Brock said.